I was listening to Ahmadinejad's talk in Durban today about Zionism and the evils of its alleged racism. Many delegates walked out, which was praiseworthy. Unfortunately , Ahmadinejad was silent about racism in his own country. Iran is not exclusively Iranian. Indeed, it is only 51% Iranian. Armenians, Kurds, Baluchis, Turkmens and Turks are among the many ethnic groups that comprise the other 49% of Iran's citizens. Four million Arabs also live in Iran. They are known as Awazis. Their language is suppressed. 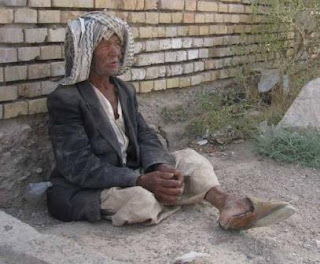 They live in poverty despite inhabiting an oil rich region in Iran. Unfortunately, the money that is made in their region is not invested in education or infrastructure. These Muslim citizens of the Islamic Republic of Iran are persecuted for their ethnicity. It should be noted that Iranian demographics are not like American demographics. Minorities are not dispersed across the country. Iran's minorities have ancestral ties to the regions in which they live. Unfortunately, they are governed by outsiders. Arabic and Kurdish, as well as the Turkic languages of Iran are distinct from Farsi. They are not dialects. They are separate languages. In a real sense, Iran is as much of an empire as was the former Soviet Union. The discontent of Iran's subject peoples is a major current beneath the surface of Iranian political life. They are not being ruled by a benevolent dictatorship that provides them with material prosperity. The Arabs of Iran are being plundered and in some cases driven from their homes by a government that cares more for the oil in the ground than the human beings who walk upon it. The status of women and of religious minorities such as the Bahais in Iran gets much well deserved publicity in Iran, but the status of its ethnic minorities cries out for scrutiny and remedial action. Ahmadinejad likes to be photographed in a keffiyeh, a scarf like garment worn by Arabs. Little known is the fact that Iranian Arabs may not wear this garment that their President wears on some occsions when he is abroad. Ahmadinejad has committed tens of millions of dollars to support Hizbullah and other terrorist groups. In light of the poverty of non Iranian parts of the Islamic Republic of Iran, this money devoted to fomenting war is an obscenity. I am presenting with this posting a video of Arabs whose homes were destroyed by the Iranian government. This was not done in wartime. It was done in peacetime against an unarmed populace for economic gain and without compensation. An honest conference on racism and ethnic hatred should address many different areas of the world. Iran deserves its own conference. Ahmadinejad should stand in front of such a conference not as a plaintiff but as a defendant. Now that we have allowed ourselves to be entertained by him, it is time for him to start answering questions.